One of Muybridge’s fellow speakers on the lecturing circuit in the late 1880s was zoologist E. Ray Lankester (1847-1929), at that time Jodrell Professor of Zoology at University College London. 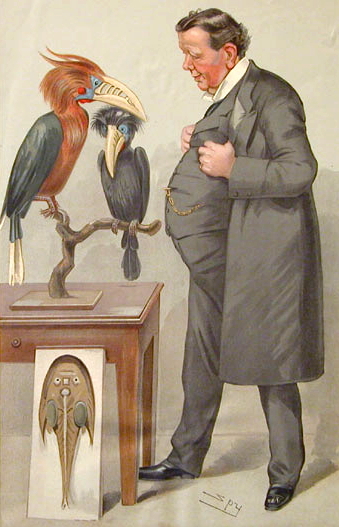 Influential as a teacher and writer on biological theories, comparative anatomy, and evolution, he would be knighted in 1907. In 1889, Lankester had written a review of Animal Locomotion in Nature. Ray Lankester was an important writer of popular science, his weekly newspaper columns over many years being assembled and reprinted in a series of books entitled Science from an Easy Chair (first series, 1910; second series, 1912). With such attention-grabbing page headers as “Drowning in a Dead Whale’s Heart” the books were aimed at a general popular readership, but Lankester was a well-educated scientist and the contents respectably reliable. One of these articles (2nd series) was entitled ‘The Problem of the Galloping Horse’, and originally appeared in the Daily Telegraph (date unknown, but some time between 1907 and 1912.) 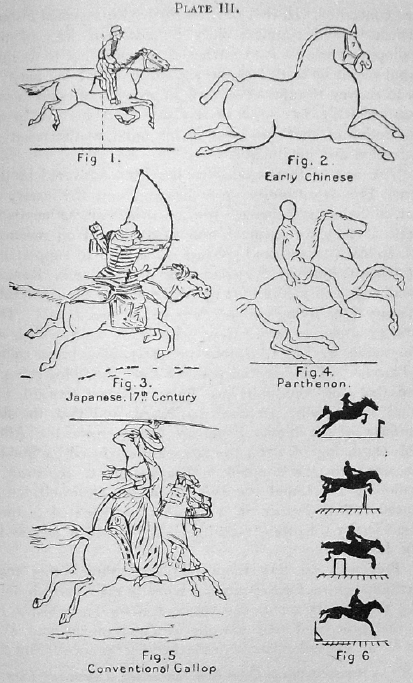 Writers have usually dealt with the subject using a phrase such as “before Muybridge’s photographs, artists had depicted the galloping horse in a ‘rocking horse’ pose, with all four legs widely spread…” but Lankester’s detailed account shows that the story is not that simple. Lankester writes of Muybridge’s experiments in sequence photography of moving animals: “I have some of these pictures before me now. They show what has been drawn by artists and called the “flying gallop,” in which the legs are fully extended and all feet are off the ground, with the hind hoofs turned upwards, never occurs at all in the galloping horse, nor anything in the least like it.” He reveals that a model showing the “actual instantaneous attitude of the galloping horse has recently been placed in the Natural History Museum.” Until 1907 Lankester was Director of the Museum, so quite likely he was instrumental in that display. Ironically, in the 21st century some museums are still creating displays in which the legs of animals in motion are incorrectly shown. The story that French academic painter Meissonier adapted his representations of a horse in motion when re-painting one of his pictures after seeing Muybridge’s photographs is well known (and comes from Muybridge himself). The story was reported in May 1887. However, Muybridge’s biographer Hendricks points out that the differences in the two versions of the painting, in terms of the gait of the horses, is very minor. Lankester focuses his attention on a painting by another artist, produced the previous year. Aimé Morot (1850-1913) was a French painter born in Nancy, where he studied under a drawing master named Thierry. He later attended the atelier of Alexandre Cabanel in the Ecole des Beaux-Arts in Paris, but left after only two weeks to continue his studies independently. During this period he spent much of his time studying animals in the Jardin des plantes, and was later to become famous for his paintings of horses, lions and bulls. Muybridge included slides of several Morot paintings – including one titled Rezonville and another of the Battle of Reischoffen – in at least one of his lecture scripts, and the slides are today in the Kingston Museum Collection. 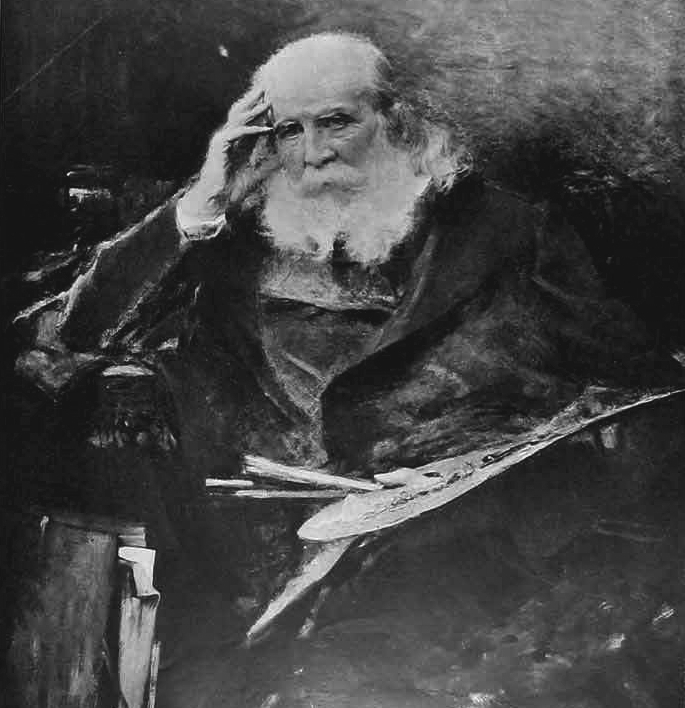 These are 1880s paintings (the latter 1887) so would have been included in Muybridge’s later lectures – and one of them was shown to accompany his comment: “It is gratifying to ascertain that our labors are beginning to reap their reward, and that some artists are prepared to acknowledge that impression before knowledge and impression after knowledge are two entirely different things. In this picture by Aimé Morot we have an evidence of the soul[‘]s awakening.”  Morot’s early rendition of the correct attitude of the horse in gallop is mentioned in art history books, but I don’t remember reading about it in books or articles about Muybridge’s work. From his easy chair, Lankester continues: “Two very interesting questions arise in connection with the discovery of instantaneous photography of the actual positions successively taken up by the legs of a galloping horse. The first is one of historical and psychological importance, viz. why and when did artists adopt the false but generally accepted attitude of the “flying gallop”? The second is psychological and also physiological, viz. if we admit that the true instantaneous phases of the horse’s gallop (or of any other rapid movement of anything) can not be seen separately by the human eye, but can only be separated by instantaneous photography, ought an artist introduce into a picture, which is not intended to serve merely as a scientific diagram, an appearance which has no actual existence so far as his or other human eyes are concerned….? And further, if he ought not to do this, what ought he to do…? English: “Baronet, 1794” oil on Canvas, location: Yale Center for British Art, Hartford, Connecticut, USA. He suggests that the first ‘modern’ example is an engraving by Stubbs in 1794 of a horse called Baronet. 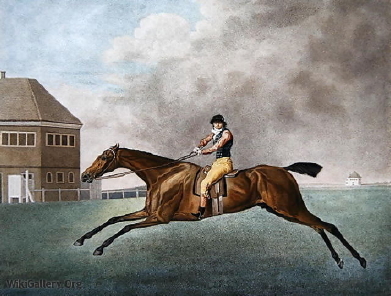 Lankester then states that following Stubbs’ example this attitude was generally adopted in English art, and the French painter Gericault introduced it into France in 1821 with “Derby D’Epsom” which is now in the Louvre. This contribution by Sir Ray Lankester, and his acknowledgements to Solomon Reinach, don’t seem to have attracted much attention by Muybridge’s biographers or more recent writers on the subject. Historians of photography are not perhaps inclined to seek out popular science books to study their subject. 1. Nature, May 23rd -which I have not yet read. 2. ‘La Representation du Galop dans l’art ancien et moderne,” Revue Archeologique, Vol. xxxvi et seq, 1900. 3. ‘Lecture by Eadweard Muybridge’, Typescript, National Museum of American History, Washington DC. This entry was posted in 19th-century photography, painting and drawing, science and tagged 19th-century media, 19th-century photography, Animal Locomotion, Kingston Museum, Lankester, Meissonier, Morot, Muybridge, Muybridge-related artwork, photography.